Head to toe. First let me state: this is personal, not clinically recorded. It is my own experience which I want to share with you about how organic extra virgin olive oil has been my skin savior. Being olive skinned (no pun intended) I took advantage of it during my 20’s and roasted my body in the rays, turning over every 30 minutes like a lamb on a bar-b-que. And I payed the price for my sacrifice. This was all before discovering a natural, whole grain/food lifestyle. Tea baths helped, but what about long term? It took about 8 years of wearing long sleeves and hats before I could tolerate even the sun’s heat through my clothes, let alone the direct sun. I did, however, stop using bar soaps or any soaps on my skin. Reasoning: the acid would wash away my skin’s natural oils which I felt were necessary to heal and protect my skin. You know, when you run water over your skin and the water beads up? It didn’t on me. Around the end of those covered years I learned about natural foods, macrobiotics, and the idea of using natural remedies and oils inside and out. Better late than never and by now my skin was very much healed but still not replenished. I started using toasted sesame oil, but it was too expensive and limiting. Vitamin E oil was too difficult, cutting the capsules was a pain, and the oil was way too viscous. Even though these worked, I discovered organic extra virgin olive oil, less expensive, easy to apply and absorbed surprisingly fast into my skin. And a wonderful bonus was that the oiliness was quickly replaced by a smooth, velvety feel. It was as if my skin was gulping it in and couldn’t get enough. Surprisingly, if I waited a few minutes after applying it, it didn’t go into my clothes. I was amazed. I felt I was finally quenching a bottomless thirst. Yes, I still have several visible reminders of those very, very idiotic times but they are necessary reminders. They make me very aware, very mindful of my own limitations and very grateful for a lifestyle that helped me discover a simple skin remedy that I use in my everyday cooking. No chemical creams, no harsh perfumes and it makes so much sense. Since your skin is the largest organ in your body, it definitely figures that what you eat to make you healthy inside, should also be able to be used on the outside. I want the vitamin D, so I do sun bathe very successfully now for about 4 hours a week. For me it’s a testament to the wonders and healing powers of olive oil. I did mention ‘head to toes’. Here’s an olive oil protein pre conditioner before shampooing: yolk of one egg, fresh squeezed lemon juice (about 1/2 a lemon), some honey (2-3 teaspoons), and about 2 Tablespoons of organic extra virgin olive oil. Mix these together in a bowl and mix through your hair till well covered, massaging into your scalp. Amounts of each ingredient will vary according to your length of hair. Let it luxuriate through for a 1/2 hour and then wash out. 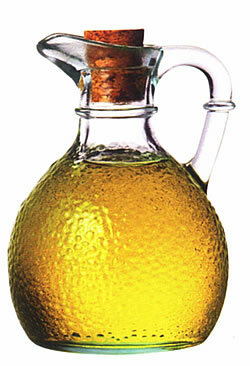 Olive oil is also a wonderful post shampoo conditioner for your hair — giving it a healthy, protective sheen. After washing and before drying, rub a little between your hands and fingers then pull through your hair. You’ll be amazed at the sheen and your hair will drink it up like your skin. You can repeat this even between washings. With all the car exhausts and air pollutants swirling around us, organic extra virgin olive oil will protect and nourish you head to toe. You know your skin type. Anyone can burn. Be smart. Start slowly and don’t exceed the time. I find now that by listening to my body, I intuitively know when the time for that day is up. I never let the sun bathing get to the point anymore, as I used to, where I can here my skin sizzle. It’s not worth it. There will be another day. One note about the tea baths: when I had a very uncomfortable or severe burn, I would throw an entire box of regular tea bags into a pot of lightly boiling water, not a large pot. You want high concentration of the tanens. I’d fill the tub with lukewarm water and then throw the full pot tea bags ‘n all into the bath water, test it to be comforably hot and then get in. The tanens work their miracle of taking the sting of the burn away. There’s no time limit here. Just relax and soak it in. When getting out of the tub, blot yourself dry. The sting should be gone. I then very gently smoothed on the thinest layer of olive oil. There’s no miracle here, it takes a while, maybe a few days but it works. There may be no need for a second tea bath. With summer sun beckoning your skin, drop me a line and let me know how you do. Oh yeah, keep an aloe plant around. It is also good on sun burns. Just cut open the long leaf arm and rub the inside over your skin. It’ll dry. However, even without burning, I recommend olive oil as a favorite everyday ‘lotion’. Eat a Rose. Be a Rose. Smell like a Rose. Yes, Roses are definitely edible as are so many others of our floral friends — as long as they’re not sprayed and are grown in a protected, organic, sustainable space. And given that we are what we eat, edible flowers should definitely be on the preferred short list. I don’t see Marigolds on the list. That’s fine with me. It’s not a scent I’d like to be. Though when planted with certain veggies etc., they’re supposed to discourage pests. Now there’s an interesting idea to consider at times. Having cultivated and eaten several varieties of edible flowers, though I can attest most definitely that I’ve not become one, they are uniquely pleasing on the palate as they are to the eye with the benefit of being nutritionally good for you. When I’m commissioned to bake natural wedding cakes, my decorations often include edible flowers. But the pictures should be taken first…the novelty plus their tastes make them disappear fast. With edible flowers also as part of the table decorations, the aroma and scent become unforgettable for an unforgettable day not only for the ceremonial couple but also for their guests. And the taste? Well, that’s remarkably unforgettable as well. Edible flowers can be included in the themes for all occasions as eatable decorations while marking extremely memorable occasions with flavor and fun. Just make sure the tastes compliment the full dinner and decor themes. But really how can you go wrong with the limitless color choices from the ultimate living rainbow? Borage – Has lovely cornflower blue star-shaped flowers. Blossoms have a cool, cucumber taste. Wonderful in punches, lemonade, gin and tonics, sorbets, chilled soups, cheese tortas, and dips. Nasturtiums – Bright, happy, tasty. A definite favorite of mine. Come in varieties ranging from trailing to upright and in brilliant sunset colors with peppery flavors. Nasturtiums rank among most common edible flowers. Blossoms have a sweet, spicy flavor similar to watercress. Stuff whole flowers with savory mousse. Leaves add peppery tang to salads. Pickled seed pods are less expensive substitute for capers. Use entire flowers to garnish platters, salads, cheese tortas, open-faced sandwiches, and savory appetizers. Lavender – Sweet, floral flavor, with lemon and citrus notes. Flowers look beautiful and taste good too in a glass of champagne, with chocolate cake, or as a garnish for sorbets or ice creams. Lavender lends itself to savory dishes also, from hearty stews to wine-reduced sauces. Diminutive blooms add a mysterious scent to custards, flans or sorbets. NOTE: Do not consume lavender oil unless you absolutely know that it has not been sprayed and is culinary safe. Fresh flowers bring the outside in — the sweet aroma, the compelling hypnotic scent that can make you stop what you’re doing instantly.You close your eyes tilting your head slightly upward straining your neck gently, you flare your nostrils to breathe in as deeply as you can filling your lungs to savor not only the heaven scent but wanting to preserve that memory to your very fiber, to the marrow of your bones. I swear that if you pay rapt attention, you can feel your brain responding, swelling with the sheer relaxation of the scent and sending that same command of openness and reception throughout your body and spirit. Even tho it might only be moments the memory of those flowers, fragrances, and feelings will be with you forever. Of your five senses, smell is usually the only one associated with flowers. Most people never think of them as food. And I can understand that until I discovered their edibility. I become transported with the sweet fragrance of my mother-in-law’s Honeysuckle tree. Equally wonderful – the flowers are edible! My whole approach and outlook toward food, when not cooked for medicinal purposes is to have fun with it. And what’s more fun at your own dinner table than to be able to eat your floral designs! The pictures above with descriptions come from the link below. I’ve been called diminutive, and I guess I am at 5’2”, and kinda thin. So when I walk anywhere with my son who’s 6’4”, 330 lbs, no one believes I’m his mom. In fact, when he was little, people thought I was his nanny – he was so big compared to me even then. His high school football team had a good laugh when I walked onto the field with him during Mom’s Day. His dream was to be an NFL defensive lineman, and although his workout routine still, at 24, equals NFL stats, he changed his direction to pursue another lifelong dream unrelated to sports. Most of his friends are athletes and most of them stayed with us at one point or another. And they all came to know and really appreciate the food he was brought up on – whole grains, fresh veggies, beans, and sugars all as organic as I could find and cooked at home from scratch. Before their next visit, they’d phone in their orders to me or through him. Feeding a football team if you’ve never done it, even for a few days, can be daunting, but surprise of surprise, they finished it all and wanted more. Doc applauds our lifestyle. My son ate his first beef burger at age 12 or 13, inadvertently, and never really did develop that much of a taste for it. True story: during a football game in high school, he banged bodies with an offensive lineman, also big. What a hit! What a horrible sound! It was a clash of the titans. And they were both carted off to the hospital. The orthopedic surgeon reported to us that the other kid came away with a broken shin bone, I’m sorry to say. However, he was incredulous at my son’s injury, a slight bone bruise. With taped leg and crutches he went back to the sidelines to cheer his team on. “Whatever you’re feeding him, keep doing it. I’ve never seen bones that size or that dense in a kid before!” Those were his exact words. That was an extraordinary feeling to have our lifestyle applauded, though not the way I would have chosen. A living answer to questions. He’s still my trophy and my testament to natural foods for kids especially when he visits my cooking classes. People just don’t believe it. True, you’re thinking there must be some big genes somewhere in the family, and yes there are, but it’s not the size, it’s the quality. He’s a walking testimonial to a lifetime of natural foods with a presence that answers their questions: “Will my child get enough calcium?” “Will they grow?” “Won’t they get sick more?” “Can they grow up healthy without all the protein and vitamins from meat and dairy?……… Yes, yes, no, and yes. Absolutely. Here. Look. And in he walks. I’ve had non natural foods kids raiding my pantry, freezer and refrigerator forever. One 10-year-old made a B-line for seaweed whenever he came. Didn’t bother him at all what it was. He just wanted it. Loved the taste and he said it made him feel good. You can’t argue with that. Kids know. Like that 10-year-old. They want to be shown, but also to be allowed to experiment. I have another true story here: I was asked to make two dishes for a grand opening for a holistic health center last year in Coronado, CA. One of the dishes was an Asian style tofu appetizer (go to my website: www.chewbite.com and click on Asian Style Tofu Wrap-Around – the very same one). A 13-year-old boy (difficult to please at that age regardless, unless…) came by in the line and wouldn’t try it (tofu, yuk!) until I told him he could spit it out in from of me if he didn’t like it. No pressure. That intrigued him enough to try it. Guaranteed he liked the idea of spitting it out in front of me. Pride of creative ownership. Make it a game, interesting, fun. Dress it up. Make it all natural and as organic as you can. Make it look like what they’re used to, but the ingredients can either mimic or be completely different. Season it and spice it up with a familiar aroma, appearance, and mouth feel. But whatever it is, it’s got to taste great! Another thing about them which you probably already know, they don’t spare your feelings. They tell you the truth. So ask them what the dish needs and get them involved in the kitchen and the preparation by letting them fix it the way they want. Let them make it their own. For you it’s hands off unless asked. Whatever the mess, whatever their tastes, whatever their additions or deletions it’s theirs’ and not only deserves but requires your respect. My son is getting to be one incredible chef choosing food and spice combinations I would never think of in a million years. He astounds not only me but his friends with his choices and complexities of taste while still sticking to organic whole grains, veggies, even meat, chicken, and wild fish. Allow them the gratification of astounding you. Their tastes are often so different from ours. There’s no age limit or requirement, by the way. So much more fun than going to formerly frozen formula Chili’s or McDonald’s or wherever and their memories are priceless. Oh yeah! And invest in a bread machine. Let them invent variations on their staple. So easy. Prenatal to post natal to pre-school to post college, they need and want guidance from mom and dad. Their culinary creativity being rewarded early with applause and respect will give them the confidence to continue natural foods in their lives and to teach their friends and their own children. Give them their jump start by changing to whole grains and veggies during pregnancy. When nursing they’re already used to the foods. And when you start introducing solid foods, they intuitively know them already. Even seaweeds. Really. Yup, even seaweeds can be luscious. It all depends on your creativity and that intangible ingredient that makes it all a hit, your LOVE. My son once observed to us from a boarding school he attended for one year for football before going to college, that he thought he was the only person there who loved his parents. Wow! Now that blew us away. He realized that we always inspired him to achieve and create, to have his own opinions, and respected his choices. Experiment. That was the year he started cooking for himself and starting teaching me. Very gratifying. He’s still teaching me. Some answers really are that simple. With the meteoric rise of childhood and young adult health diseases: diabetes, obesity, eating disorders, high cholesterol, asthma, high blood pressure, depression, ADD, ADHD, and the lists goes on and on…… Diseases once thought to be brought on by age deterioration in adults are now epidemic, even plagues among our children. Drugs are not the answer. One definite answer is natural foods. Too simplistic? Things in life don’t have to be that complicated. You really are what you eat. We sold our souls and our health. It’s the insidious invasion of the soul snatchers in the guise of the big pharmaceutical companies and the big brand name food manufacturers all in collusion with the advertising companies and the food/chemical lobbyists in Washington D.C. I refer to Dr. David Kessler’s (former FDA commissioner, 1990-1997) new book, “The End of Overeating: Taking Control of the Insatiable American Appetite”. He writes about just this, not that we didn’t know it already, but a former FDA boss telling us from the ‘inside’ about how our souls and health have been hijacked for profit is pretty frightening along with our disastrous eating habits being engineered by those companies’ food scientists. Very scary, but not irreversible. Now it’s time to create your own good health! Get your whole family into the kitchen. Have fun creating a lifestyle change that makes you happy and gives you the power of choice. Food becomes an exploration into a culinary world of individual tastes designed by you that changes with your whims by adding a little bit of this or a whole lot of that. And your children? They’ll love it!